After a disappointing British Open, Jack Nicklaus was too hot to handle as he added the Wanamaker Trophy to his impressive – and growing – collection. 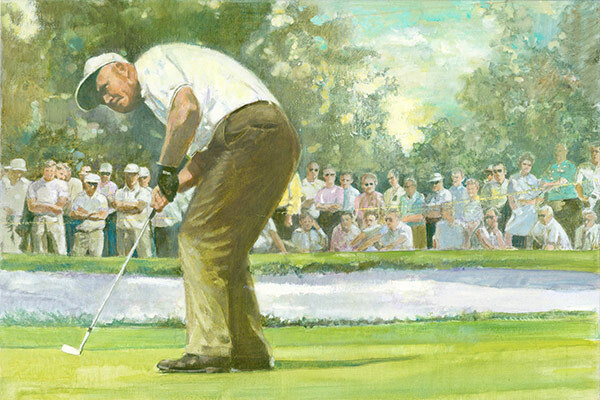 Jack Nicklaus opened 1963 with a victory at the masters tournament but then failed to successfully defend his U.S. Open title at The Country Club. Then, seeking his first British Open victory, he missed making a playoff with Bob Charles and Phil Rodgers by a stroke. Five days later and perhaps in a swing of 50 degrees in weather conditions, he would tee off in the PGA Championship under brutally hot and humid conditions at the Dallas Athletic Club. In temperatures that reached over 100 degrees, Nicklaus closed with a five-under-par 66 to edge Dave Ragan by two strokes. At age 23, he joined Gene Sarazen, Byron Nelson and Ben Hogan as the only players to win the Masters, the U.S. Open and the PGA Championship. At the awards ceremony, he and his wife, Barbara, were forced to use a towel to hold the blisteringly hot trophy.